What Goes Into a Pre-Employment Background Check? Home > Resources > Background Screenings > What Goes Into a Pre-Employment Background Check? When interviewing job candidates, employers must weed through exaggerated credentials and misrepresented information to avoid the legal threat of negligent hiring. One way for an employer to obtain information on a potential employee is by obtaining a pre-employment background check. 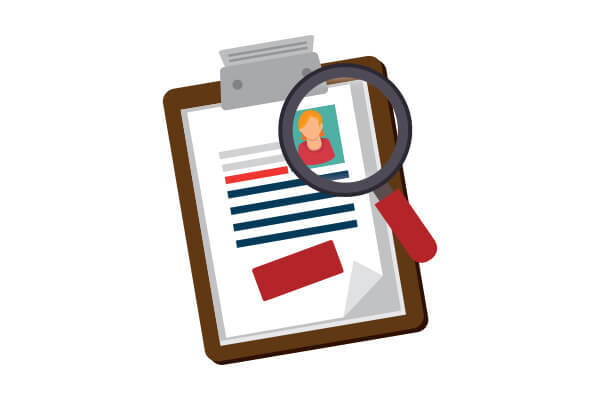 This screening provides information on a candidate’s criminal history and helps verify information the candidate provides on a job application, such as his or her Social Security number. Obtaining a motor vehicle report helps an employer assess a job candidate’s driving records, including his or her commercial driving license status for up to seven years. This report also lists all traffic infractions, including charges for DUIs. Even if the job candidate has moved, pre-employment background checks can pull reports from all 50 states. This type of information is essential for employers looking to hire someone to drive a company vehicle or to drive a personal car for company use. An employer can easily determine whether or not a job candidate has a criminal record by obtaining a county-level criminal search. These reports contain information on any felony, misdemeanor or offenses at the county court level. Usually, a background service company will pull county-level criminal reports from counties where the job applicant is most likely to have such information, such as current and former counties of residence. The first step in verifying that a job applicant has provided accurate information is by running a Social Security number trace. This trace obtains a list of current addresses, previous addresses, as well as other names the applicant has used before. The trace also verifies the applicant’s Social Security number by providing the state and date range of issuance. As such, it is the first step in profiling a potential employee. Since 1996, Oschmann Employee Screening Services has led the nation in developing, managing, and servicing Drug Free Workplace Programs. In addition to offering pre-employment background checks, we offer drug testing in Arizona. For more information, please call (520) 745-1029 or (800) 224-8532.